Here is a very interesting way of seeing the periodic table of elements. 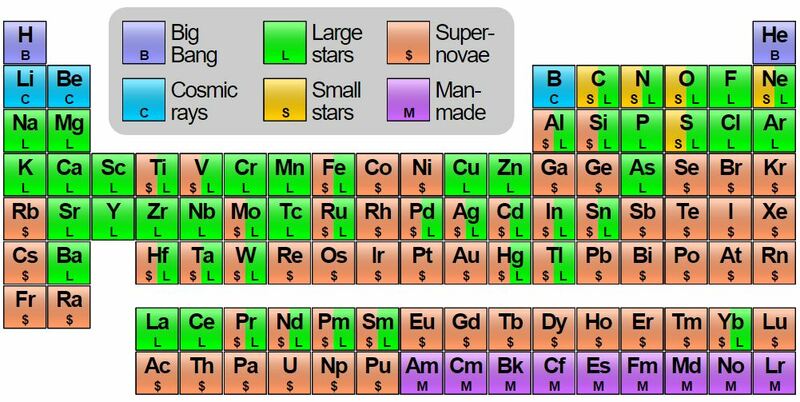 By its colors, we see where nucleosynthesis happens in the universe. Nucleosynthesis is the process by which atoms of everything besides Hydrogen originate. Atoms, the 3D pixels of energy that everything solid is made of, are generated mostly in the core of large stars, and in Super Novas. The periodic table of elements, color coded to show what processes in the universe produce atoms. Hydrogen, the simplest element, with only one proton in it nucleus, and Helium with two protons, were produced in the original creation event; The Big Bang. The rest, as they say, is history. Carbon, which is essential for all known life to exist, as with all the other atoms on the periodic table of elements, was produced after the initial event, ‘cooked’ in stellar ovens and exploding stellar engines. The raw energy of the Big Bang that is locked into the shape we call Hydrogen and Helium is not cooked though, like a meal is cooked, or like a cake is baked. Rather, these simpler elements are cooked, as in the sense of being processed, or refined and combined, to generate raw ingredients. From these raw ingredients, produced mostly by stellar processes, we get the stuff our body, the world, and everything in it, is made of.